The third Monday of February is known as Presidents’ Day in the United States. For nearly 100 years, America honored its first president, George Washington, on February 22. That was his birthday. But the date was not a national holiday until 1968. That year, the U.S. Congress passed a measure known as the Uniform Monday Holiday Act. The measure meant that some public holidays would always fall on a Monday. Today, the country honors its first president on the third Monday in February -- and not on Washington’s real birthday. And the holiday is now commonly called Presidents’ Day. 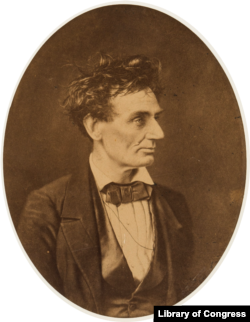 Many say it also honors Abraham Lincoln’s birthday. The nation’s 16th president was born on February 12. The Uniform Monday Holiday Act gives workers a three-day weekend. It also gives shops and marketers a chance to have special Presidents’ Day sales. 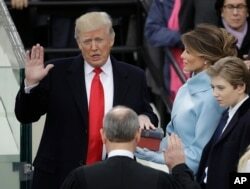 Last year, Donald J. Trump made history when he took the oath of office as the 45th president of the United States. At 70 years old, he became the oldest elected president. Before Trump, Ronald Reagan was the oldest person to take office. He was 69 years old when he became president in 1981. As the first billionaire president, Trump also replaced John F. Kennedy, the 35th president, as the richest man to serve as president. Kennedy still holds the record for the youngest person to be elected president. He was 43 when he took office. Kennedy is also the youngest president to die in office. He was assassinated in 1963 in Dallas, Texas. He was 46 years old. Another presidential assassination actually put the youngest person in the office of the president. In 1901, Theodore Roosevelt, then the vice president, became president at the age of 42. He took office after William McKinley, the 25th president, was shot and killed in Buffalo, New York. The first president to die in office, though, was William Henry Harrison. The country’s ninth president only served 32 days, the shortest time of any president. Another Roosevelt holds the record for the longest time in office. 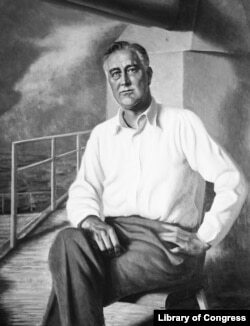 Franklin Delano Roosevelt, the 32nd president, held office for 4,422 days. After his death, the 22nd amendment was passed. It limited a person to two four-year terms as president. Most Americans know that the two Roosevelts were related. But they may not know how, exactly, they were related. Here it goes. Franklin Roosevelt’s wife, Eleanor Roosevelt was also his fifth cousin once removed. And Theodore Roosevelt, the 26th president, was Eleanor’s uncle. That makes the two presidents distant relatives. But they were not the first relatives to both serve as president. That title belongs to the Adams. John Adams was America’s second president. His son, John Quincy Adams was elected as the nation’s sixth president. The Bushes are the other father-son presidential pair. George Herbert Walker Bush was elected as the 41st president. His son, George W. Bush, was the country’s 43rd president. Not everyone can run for president. But the meaning of “natural-born citizen” is not exactly clear. People read the rule in different ways. The first “natural-born” American president was not George Washington or John Adams. 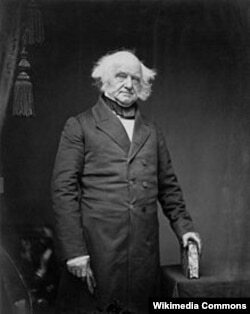 It was Martin Van Buren, the eighth president. He was born in 1782, six years after the signing of the Declaration of Independence. All seven presidents before Van Buren, and William Henry Harrison, the ninth president, were not “natural-born” citizens. They were born before 1776, when the American states were still British colonies.